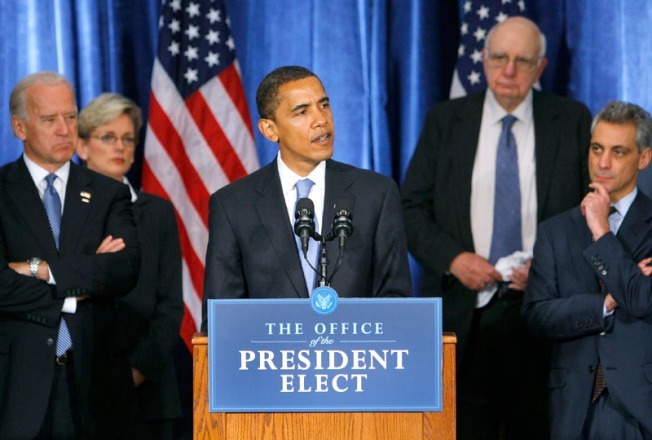 Former Federal Reserve Chairman Paul Volcker (standing to the right of Obama) will head the President-elect's new economic board. President-elect Barack Obama on Wednesday will announce the creation of a president’s Economic Recovery Advisory Board, chaired by former Federal Reserve Chairman Paul Volcker, to provide outside advice from heavyweight thinkers, officials said. Obama, who will be the sixth president Volcker has served, plans to make the announcement in Chicago at his third news conference on the economy in three days, allowing him to dominate news coverage during Thanksgiving week. The officials said the idea came from Obama, who wanted to preserve the advisory structure he had come to appreciate over the course of the campaign. The new body also reflects the magnitude of the nation’s economic problems, which Obama wants to solve in an integrated way – not just through attention to markets, but also to jobs, wages and housing foreclosure. The economic-recovery board’s staff director and chief economist will be Austan Goolsbee, who was senior economic adviser to the Obama campaign and will also be a member of the White House Council of Economic Advisers. The other board members – eight to 16 people of a caliber of Eric E. Schmidt, chairman and executive officer of Google Inc. – will be named later. The board initially will exist for two years, but might well be extended for longer. Transition advisers expect it might meet roughly once a month. Obama’s plans for the board were first reported by The Wall Street Journal.